February is here and Valentine’s Day is just around the corner! 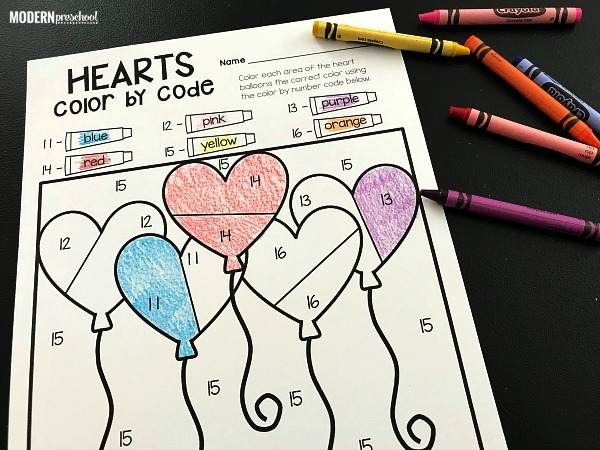 We are all about those tricky teens and using color words in my preschool classroom, so my little learners are doing a great job with our Valentine’s Day color by number printable freebie. It is a great learning center to practice number recognition, visual discrimination, colors, pencil grip, and controlled fine motor skills. And the color by number sheets are perfect for Valentine’s Day! 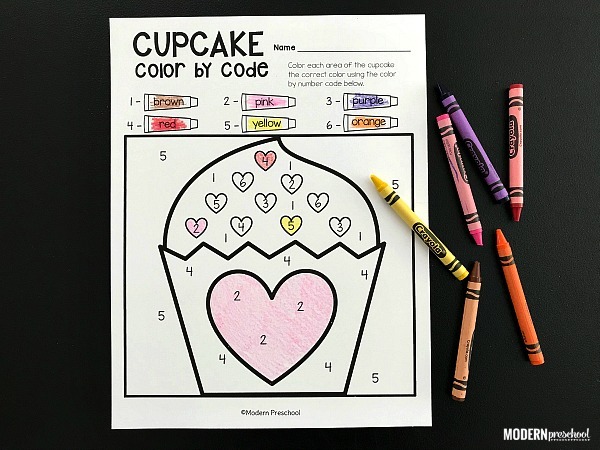 The Valentine’s Day color by number printable activity includes 2 options to fit the learning levels of your preschoolers and even kindergarteners. 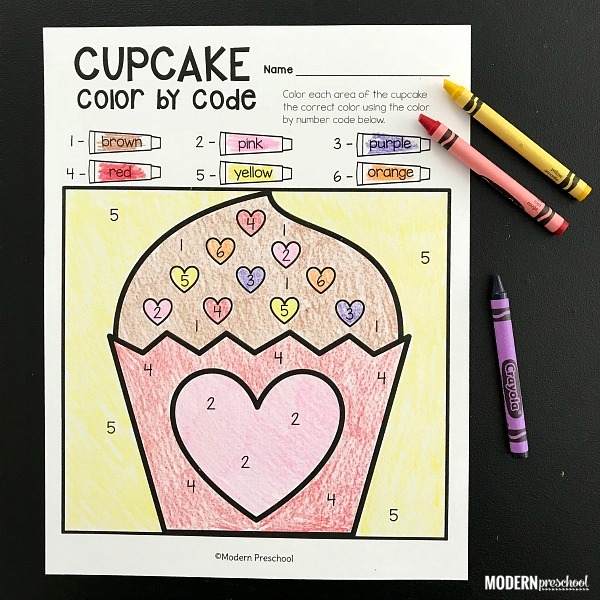 The cupcake page includes numbers 1-6 and 6 color words. 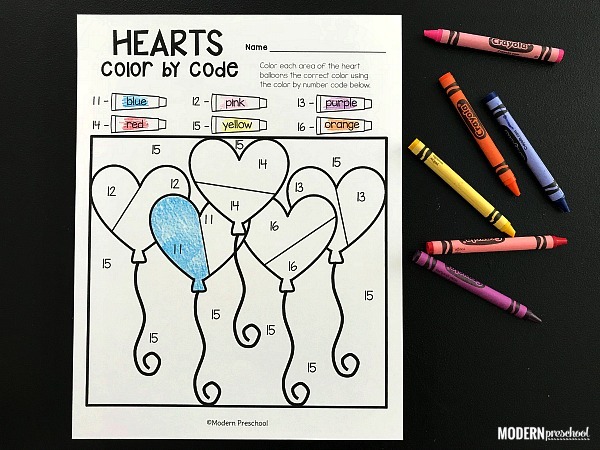 The heart balloons page includes numbers 11-16 and 6 color words. Print the page (from the pink button below) that works with your learning level, or print both to use with different kids in your classroom. I know that I have certain kiddos who insist on doing both when we do these color by code pages. It is nice to have this option! After putting our names on the Valentine’s Day color by code, we go through and color the crayons at the top of the page with the correct color. Sometimes I only have out the colors used on the page, and sometimes I have all of our crayons out. When I put all of our crayons out, it takes longer for the kids to find the correct color (especially because red and red violet are so similar! ), but I like to watch their step-by-step thought process. After coloring in the crayons, we will all find one number together. I will tell the kids at my table to “put their finger on the number 11.” After I do a quick scan to make sure they all have the number correct, we will go through to decide which color that number should be colored. When we first began using these color by code pages, I had to definitely explain how we needed to color the entire area where the number was. A bunch of my preschoolers would color over the spot where the number was and move on. At the beginning of the year that was ok to do, but not anymore. With these pages, I now insist that the preschoolers color the entire area so that at the end the entire page is colored in. This is hard work for some, but those small, controlled movements with their crayon not only strengthen fine motor skills, but will make writing letters and words easier in kindergarten. And with practice, it gets much easier over time! By this time of year, almost all of my preschoolers can sit down and complete a color by code page by themselves. We’ve been using them throughout our themes in our literacy and math centers and it has made a huge difference in their high frequency words, letter recognition, numbers, and direction following skills! Valentine’s Day just may be my very favorite time of year with preschoolers! Christmas is a close second, but February is a calmer month overall which makes more time for out of the box kind of learning. 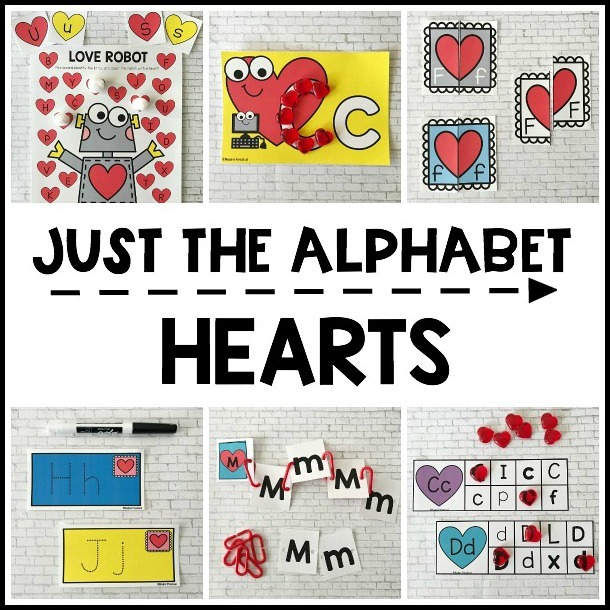 I love adding super simple Valentine printable activities to our morning in preschool because I can prep them once and use them over and over again for years! 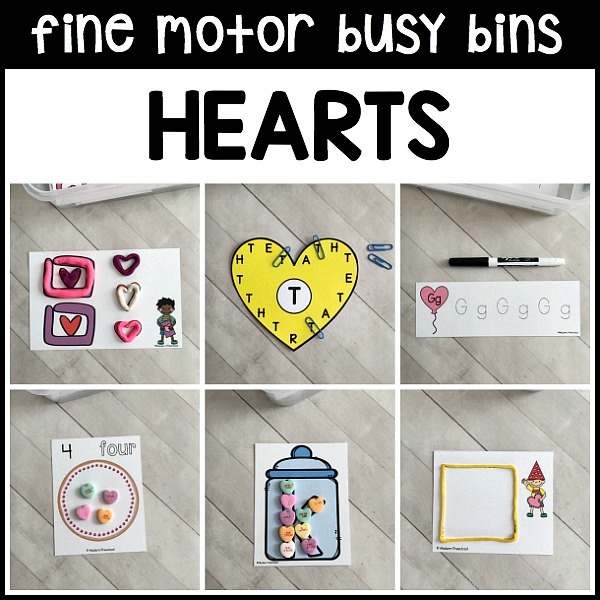 And our Valentine heart themed fine motor busy bins are life savers in the morning as the kiddos come into the classroom! Some mornings I have an assistant teacher with me, but some mornings she is outside helping kids get out of cars in the drop off line. So having something for the kids to play (and learn!) right away when they enter the classroom has made the start to our mornings much smoother. 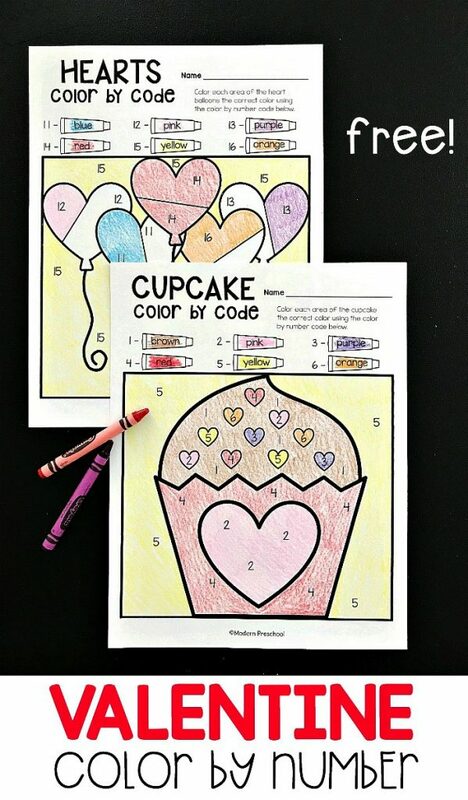 Grab the Valentine’s Day color by number printable activity now!